Often following a storm, the presence of a rainbow provides optimism and motivates us to endure through dark times. Similarly, organ, eye and tissue donation is the bridge of comfort and hope between one family’s mourning and another’s healing — turning tragedy into renewed life. The vibrant Donate Life rainbow in the National Donate Life Month artwork rises from stormy clouds, recognizing that it takes both rain and light to create the gift of a rainbow. Maya Angelou’s message applies to all of us, no matter our background or experiences. We all know rainbows — people that have helped carry us through life and its challenges. In turn, we may also have the opportunity to be rainbows in other people’s clouds through the gift of organ, eye and tissue donation. This April, we encourage you to reflect on the lives of those touched by donation and transplantation, and to share its prismatic effect. By registering to be a donor or considering living donation, you can change one ray of light into a spectrum of healing and compassion. We wish you a Happy National Donate Life Month. Thank you for your efforts in educating about the cause of donation and the importance of registering your decision to be an organ, eye and tissue donor! Maya Angelou™ is a trademark licensed by Caged Bird Legacy, LLC. 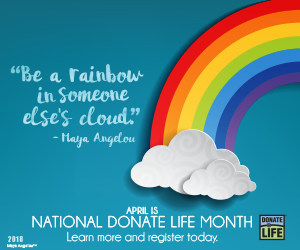 Read about how you can use the resources from DLA to help promote donation during National Donate Life Month – Implementation Ideas. You can also visit DLA’s website to download the official 2018 NDLM reference materials, social media graphics, web banners and print materials – Click here! Next Next post: Celebrate with Us On National Donate Life Blue & Green Day!